Yahoo just laid another brick in the road to its password-less future: In a blog post, the company showed off its new mail app and another way for users to enter their accounts without needing to remember a password. 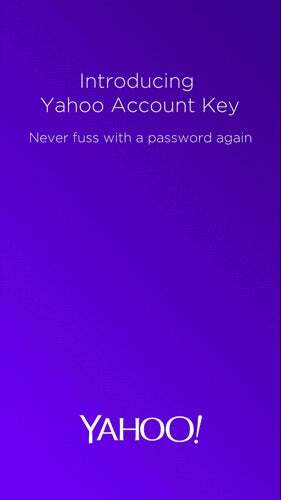 Th feature is called Yahoo Account Key, and it’s a lot like on-demand passwords–the passwordless entry tool Yahoo introduced in March. Except now, logging in requires that the mail app be installed in your mobile. Yahoo Account Key works like this: After users link their tablets or smartphones to their Yahoo accounts and install the app, their login process changes. Instead of filling in an email address and a password to gain access, the site will recognize that a person’s email is setup with Account Key and send a push notification to their phone. On the phone, all that person has to do is either approve or deny the request to login on the website—no codes required. It’s important to note this isn’t really a second step of authentication, like Google’s 2-Step Verification sign in process. But there is a little comfort in knowing a hacker has to steal (or gain access) to your handset to gain access to your account. And if you’re in that group of people that has a hard time remembering a password, you’ll probably love this sign in feature—just don’t lose your phone, break your phone, or let the battery die, and you should be OK. The new Yahoo Mail app is ready to be downloaded today for iOS and Android. And another great necessary addition to the app: It finally lets users with Outlook, Hotmail and AOL accounts login (no Gmail yet).